Admiral Allen held another briefing today in which he elaborated a little more about the procedures to be followed when the two wells, the relief (RW) and the original (WW) are joined. He also promised that in a briefing tomorrow he will bring together the different numbers that have been used for well positioning - the measured depth and the true vertical depth – so that everyone can start talking from the same page. However, in discussing the connection between the two wells he broke down the process into four parts, and to illustrate these I am going back to the figure that I used yesterday, and making a couple of modifications to it so that the process might be better understood. I am also going to revisit my gripe about the “band of brilliant minds” which Secretary Chu put together, but who seem unable, in a timely fashion, to decide whether to allow BP to change the cap on the well, or not. 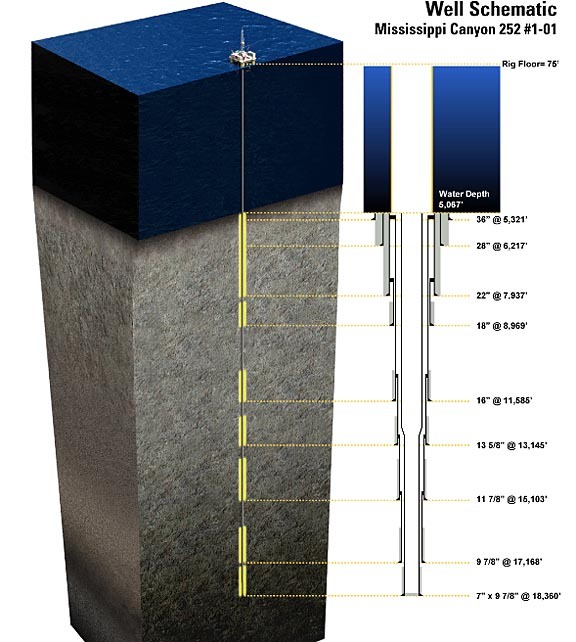 So to begin with let me start with the illustration from yesterday showing the possible configuration at the bottom of the lined section of the Deepwater Horizon well. Development Driller III, which is the lead drilling rig for the relief wells is now at 17,780 feet measured depth, within a couple hundred feet of the proposed penetration point of the wellbore. Well it was at 17,700 ft on Monday, so the progress has been 80 ft over three days, but with 200 ft to go from the beginning, we should perhaps be about 120 ft above the intersection. For those who want to do the math Haliburton, if my memory serves, injected 55 barrels of cement into the well at the bottom of the production casing, and the casing has a 7-inch outer diameter. I believe the last section of the well was drilled at 8.5 inch diameter from this bit of the Congressional information. 1. Ensure BOP has been tested (per compliance with approved APO). 2. Ensure 16" liner and blind shear rams have been tested (per APO requirements). Record pressure with volume pumped. • If a short trip is not required, circulate per step 7. 6. If tight spots were seen, make a short trip to the casing shoe to ensure any tight areas have been properly cleaned up and mud weight is correct. 7. Once at TO again, pump a 100 bbl weighted / viscous sweep and circulate hole clean with a minimum of 1-1/2 capacity. • Circulate and condition, as required, to clean hole and lower yield point for running liner (lower YP to -15 or as hole conditions dictate and keep gels flat). 8. POOH and retrieve the wear sleeve. • Do not rotate once the wear bushing has been pulled. I may revisit those procedures in a later post, since they contain several bits of information that has been debated after some earlier posts. To return to the discussion of the kill process, the RW will drill over so that it intersects the WW in the gap zone below the last lined section. 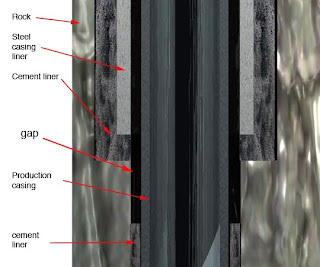 This means that the drill will enter the gap between the production casing and the well. At the point that the drill enters this space, the mud in the RW will flow into the WW, and be carried by any oil and gas flow up the well. At this time the mud pumps on the ships will kick into gear, and keep pumping in mud at a relatively high rate, so that the mud concentration in the column now flowing up to the surface through the WW annulus is as heavy (mud containing) as possible. The relief well is not cased but is, at this stage an open hole connection (i.e. just lined by the rock drilled through). Once the mud reaches the surface, and the concentration, over time, increases to the point that flow up the annulus is halted (because the mud column weight exceeds the reservoir pressure) then – if flow is only through the annulus, the well has been killed. To seal it, the mud is displaced, at the bottom of the well, by injecting a cement plug into the well, that fills the bottom of the relief well and the annulus. 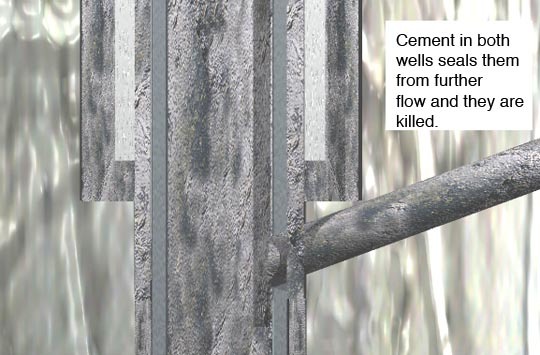 If the flow of oil has only been up through the annulus, there should, at this point, be no more oil flow out of the well, and the top of the well can be sealed with an additional cement plug, (as will the relief well) and the site can be closed down. 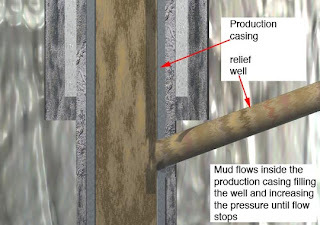 However if the oil flow continues, then it means that the oil is flowing up the inside of the production casing, At this point the drill is replaced on the end of the drilling string in the RW and the drill drills the cement plug out of the well, and continues drilling forward until it has penetrated the production casing. (It will use PDC cutters to do this). As before the mud in the RW will flow into the open channel, and with the mud pumps engaged, mud will flow into the central bore of the well filling it with a heavier and heavier mud concentration, until, again, the pressure exceeds that in the rock, and the oil and mud flow stop. The well is now killed. 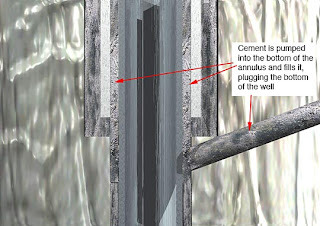 Once the well is stable, then, as in the earlier step, the mud is replaced with a cement to create a plug at the bottom of the WW and the RW and the wells are sealed. Additional caps at the top of the wells, and they can be closed down. What will have to happen is when the relief well is adjacent to the well bore and close enough to be able to turn to make the penetration, then we'll first penetrate the area outside the well pipe. Number one, if you take into account that you’re going to exhaust every possibility, if you go someplace and there’s not oil and you have to go find it in other place in that wellbore and you have to first seal what they call the annulus, the area outside the pipe, with mud and then cement that and go back in and re-bore into the pipe itself because you’re going to slowly remove any source of oil the closer you get inside the wellbore. If you have to do all of that, it will take you well into August. If you get in there and you find the oil, you can see the oil in the annulus of the well bore the first time around, then it could be shorter. So it could happen, but I’m not going to assume that. I’ve been around you folks long enough to know that we need to under-promise and over-deliver. He also mentioned that the decision on the cap had not yet been made. I am asking BP to give me a detailed timeline in 24 hours on how they would accomplish the hookup of the units producer to the free standing riser pipe and then how they would move the current containment cap off, putting a containment cap on that would effectively seal the top of that well and go to the new containment structure, which does a couple of things, it gets us to a production capacity and a redundancy in the system of 60 to 80,000 barrels of day. I have asked BP to give me within the next 24 hours a detailed timeline that we can look at and then approve that will allow them to move forward. If we can take advantage of this weather window we will certainly do that. The we here is the “brains trust” that Secretaries Chu and Salazar have assembled, and who will vet the idea. Here is my gripe. They have known about the design and the plans for weeks now. They have a short window of opportunity before the next storm rolls in and stops the effort, and they are only now getting the paperwork that they have to approve. It does not seem unreasonable to ask why this wasn’t done over a week ago, so that approval was in hand the moment that the weather allowed the procedure to begin. If the weather closes in again before the approval is given and the process completed, whose fault is this? 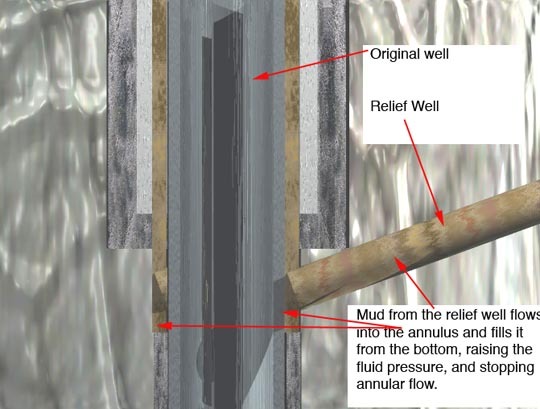 If the new cap is on, then when mud flows up the well it will go through the BOP and the sealed cap and up to the surface so that there is an additional pressure on the bottom of the well. If it is not, then the mud column weight above the BOP is lost. But the Federal Government is in charge, and processes and procedures must be followed, as they are repeatedly now informing folk. Sigh! So if the opportunity is lost, why that is just the way things go! For the first 12 hours on July 8 (midnight to noon), approximately 8,565 barrels of oil were collected and approximately 3,940 barrels of oil and 28.3 million cubic feet of natural gas were flared. • and approx. 57.6 million cubic feet of natural gas were flared. Professor, thanks for another enlightening post. I did not know anything about deepwater drilling (or frankly any of the subjects you write on) and happened across your site in my attempt to understand the DH disaster. I have now been reading your blog for about 6 weeks and love it! I literally can not wait to check in every night. I know at this update rate and with the thoroughness of your writing it is a lot of work to post. I am sure many other quiet "lurkers" on your blog appreciate it as well. Great job on educating us! Some famous general once said something like: an adequate plan implemented aggressively today beats the perfect plan implemented tomorrow. But the general did not have a Nobel Prize, unlike Mr. Chu. The bumbling of the Administration is truly disgusting -- and very harmful. It is not clear if the retired Admiral grasps the point that the oil is not materializing inside the Macondo well. It is moving from the reservoir OUTSIDE the casing into the well under the influence of a pressure differential. When dense fluid is injected at the base of the well, that pressure differential will cause it to follow the same flow path as the oil -- whether that is up the annulus or round the casing shoe and up the casing. Sigh! indeed. Yes, I am surprised about this. I perhaps naively thought it was sufficient to pump mud in anywhere near the 'bottom' of the well, and it would be carried up the drill bore until the pressure stopped the flow? Never understood, either, what the problems were in unbolting the flange at the top of the bop and bolting on a tight connection?